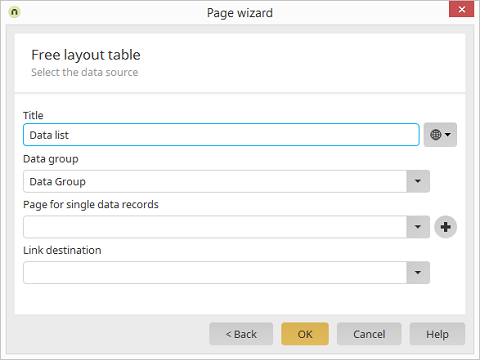 Applications module Page wizard / Click on "Next" Select Data list / Continue to Data list dialog Select Free layout table / Click on "Next"
Enter a title for the free layout table here. Further information about this topic can be found here. Select the data group whose data should be listed. Every page suitable for displaying data in the Free layout table will be available for selection here. Opens a dialog where a new view page can be created. If you selected a mobile device as the end device on the first page of the Page wizard, you can also define the link destination here. Select the page that should be loaded when a record in the free layout table is selected.